One year in the past, I had dressed up by myself as Marty McFly as he’s one of my favorite characters from one of the greatest movies, in my humble opinion. However, dressing up solo didn’t quite feel like the full cosplay experience. That’s not to say I didn’t enjoy it and have a blast taking photos for and with people (particularly when Mattel had their replica toy Hoverboard that year), but when looking around the Con at all the people dressed up, they seemed to be having more fun when they had a partner or group of fellow cosplayers with them. In the past, I had never had the luck of going with people who were willing or able to dress up as anything, but this year was different. The friends I went with were completely on board and we were able to scrounge up costumes for everyone at the last minute as the Super Mario Brothers (Mario and Luigi) and their evil counterparts (Wario and Waluigi). I had decided to dress up as Waluigi, and I tried to be as accurate as possible with the costume, mustache, elf ears, and of course pink nose. We all sported great glued on ‘staches except for our friend who’s natural mustache couldn’t be thicker or more spot on. Oh, and I didn’t mention one of the guys went as far as dying his overalls purple for accuracy. Needless to say, we all looked sharp, well, as sharp as cartoon Nintendo characters can. We all left together and hopped on the bus and headed to the convention center for our day dressed up. As we got off the bus and walked into the convention center, we had a couple people here and there looking at us as a group, which I had to say felt kind of cool. But it wasn’t until we walked onto the convention floor that all our work as dressing up paid off. As soon as we walked through those wonderful double doors to the convention floor we were immediately hit with stares and smiles. It was only another minute or two before we got stopped by a couple that wanted to take a picture with all of us. One picture lead to another and soon we were stopped on a corner taking picture after picture with group after group. We wanted to enjoy the Con but we were having a lot of fun taking the photos too. The photos weren’t about the attention; though sure it felt good to be validated for ones costumes. The photos were fun because you were entertaining other people. Boys, girls, men, and women of all ages and fandoms were smiling because they enjoyed seeing and taking a picture with a beloved character of theirs. I’m not even overly fond of Waluigi or the Mario characters for that matter, it just felt amazing to put smiles on other people’s faces. After a while, we all split off in our own directions, as quite often happens at Comic-Con, and as we did so, people did not care about taking a photo with me as much, at least as a Mario character who’s name isn’t Mario or Luigi. This actually worked to be an added bonus because this way, when I was with the group I would be stopped and get to take photos with people and enjoy making them happy, but then I could also go off and have my own uninterrupted fun. It was a wildly good time posing for as many photo ops as possible by myself as Waluigi with props, in thrones and slaying dragons (I can’t tell you how cool Comic-Con is, seriously). But it wasn’t until I was standing in line for a photo-op with a couple props that I had my highlight of the day and highlight of the Con. While I was waiting my turn to grab the rope and do my best impression of climbing a building, I happened to look down to my left and there, in the midst of video games, lights, and cosplayers was an adorable little boy who couldn’t have been older than 4 or 5 years old. He stood a couple feet away staring back at me, eyes sparkling and mouth open in amazement. I obviously caught on that he was impressed with my cosplaying skills, so I smiled and waved and said “hi.” His mother who was standing next to him complimented me on my costume and asked her son, “Do you know who that is?” Eyes wide, mouth agape, and without missing a beat, the boy was able to squeeze out, “that’s Waluigi, he’s my favorite” in an excited whisper with what breath he had left. At this point I couldn’t help but smile ear to ear. 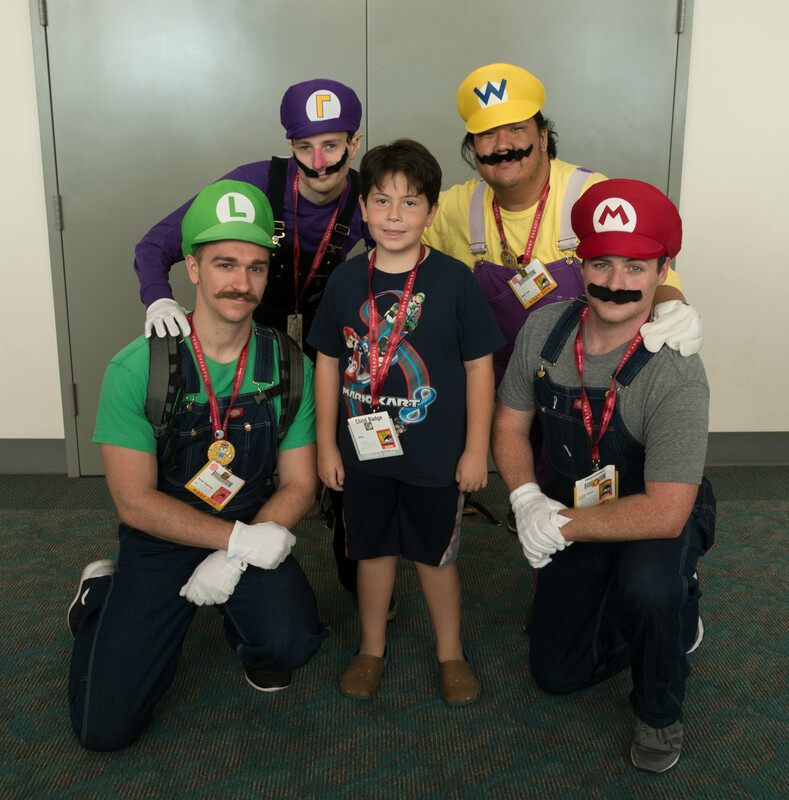 His mother told me that the boy loved the Mario Brothers games and that Waluigi was indeed his favorite and asked if it would be too much trouble to take a picture with him. Excitedly, I hopped out of line, dropped my stuff and took a couple photos with him and asked the mother if he wanted a picture of us both climbing the building as well. So I hopped back in line and was able to squeeze some rudimentary conversation out of the little guy, he was only about 4 so I stuck to his love of Mario. I had no problem taking more photos after seeing the expression on this boys face. By dressing up as Waluigi, I had excited this boy more than I could have ever imagined exciting anyone over Waluigi. I can’t express how much fun it was to bring joy to others and couldn’t recommend Cosplaying at Comic Con more highly. I started the day thinking I was going to be a a lesser character that people wouldn’t care as much about, in a group cosplay, and a villain at that. By the end of the day, and through all the people I had taken pictures with, particularly that little boy, I realized I had helped to enhance other people’s Comic Con experience, put smiles on their face, and helped one boy meet his favorite character.